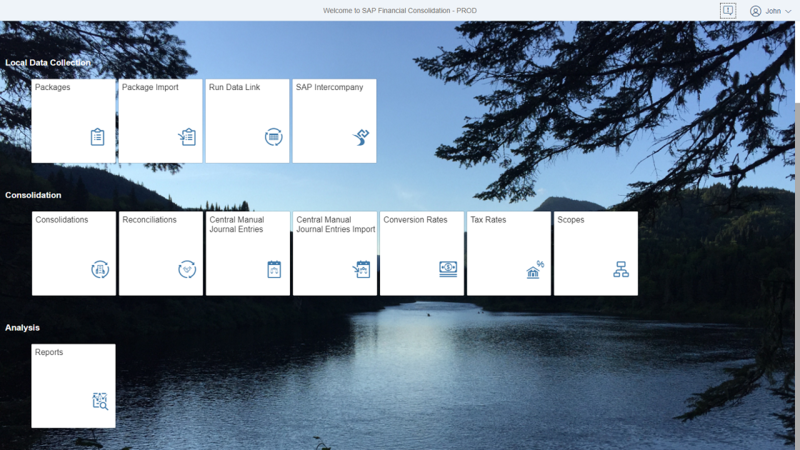 The updated web user interface (UI) of SAP Financial Consolidation 10.1 provides a seamless and elegant web experience compared to our legacy web client. We have developed our new SAP Fiori HTML5 web UI in co-innovation with business end-users, incorporating their ideas to reflect the way you actually work with the software today. Thanks to co-innovative development with our users and to ideas collected from our online collaboration platform, SAP Customer Influence, we have not only modernized the HTML5 web user experience, but also delivered on numerous new and unique features compared to both the legacy web and Windows clients. 1. While our legacy web application only supports Microsoft Internet Explorer, you can now use the new HTML5 web application across multiple browsers: Google Chrome, Microsoft Edge, Mozilla Firefox, Internet Explorer and Apple Safari. 2. We re-envisioned, customized and simplified the HTML5 web user experience (UX) using the SAPUI5 components and the SAP Fiori 2.0 UX design principles, which won a Red Dot award in the Interaction Category. 3. When you enter dimension members, you can type the first letters and the UI will display a suggestion of possible relevant members. Alternatively, you can still choose the member in a list. 5. You can customize the HTML5 web login page with the corporate background images of your choice, making SAP Financial Consolidation “your” software. 6. ♦You can customize the HTML5 web login page with gadgets and add links to your reporting calendar, accounting standards, or any other important information such as phone number or email. 7. ♦Use our HTML login gadget template and make it yours. 8. ♦Create and display important messages you want all your users to see (for example an unexpected global platform issue or a planned downtime). 9. Customize the HTML5 web homepage background with your corporate customized image. 10. ♦Create your own tiles in the homepage with links to your reporting calendar, accounting standards, direct contact to your internal support team, links to specific reports, or any other important information you want your end-users to see. 11. ♦Use our XML Custom tile template and tailor it to your needs. 12. ♦Decide who can see your custom tiles via owner group. 14. You can define your own domain order – My Recent Work, Local Data Collection, Consolidation, and Analysis – so that the homepage shows what you want to see first. 15. Directly access your most recent work items from the homepage through My Recent Work domain. 16. Directly access package and journal entry imports. 17. You get access to a mini-dashboard through the SAP Fiori page header included in each HTML5 web editor; for example on packages and manual journal entries (see 10 to 13). 18. 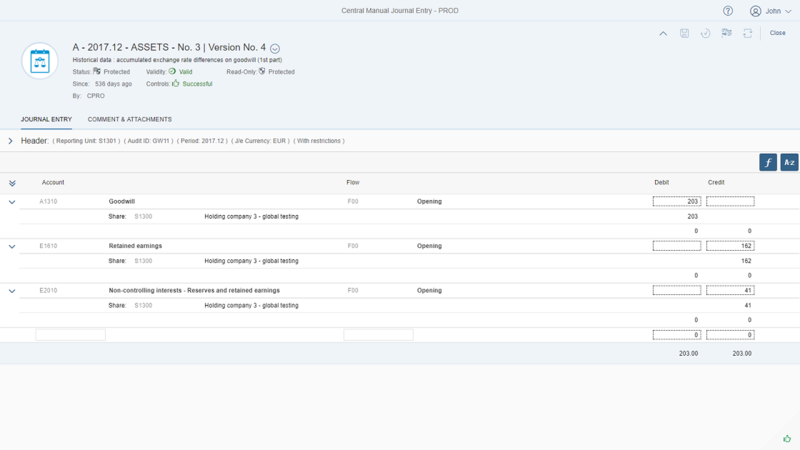 See the overall status and properties of your package or manual journal entry (such as last update or controls) at a glance and at any time in the SAP Fiori page header. 19. 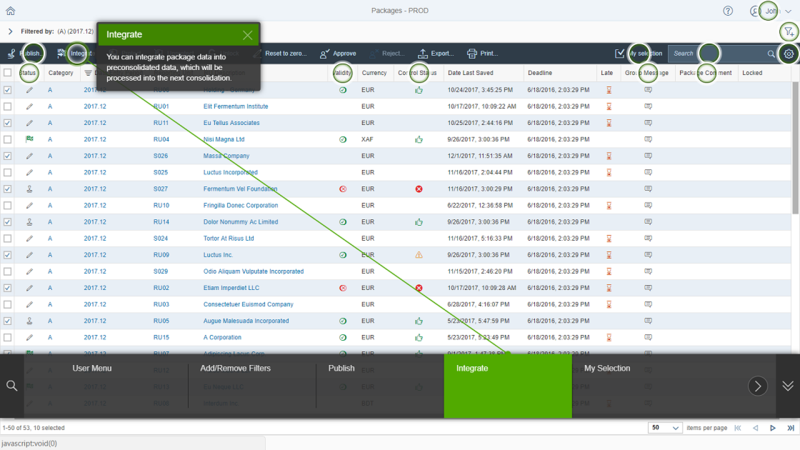 All possible actions on the package or journal entry you are working on – for example, publish or post – are always available in the SAP Fiori page header. 20. 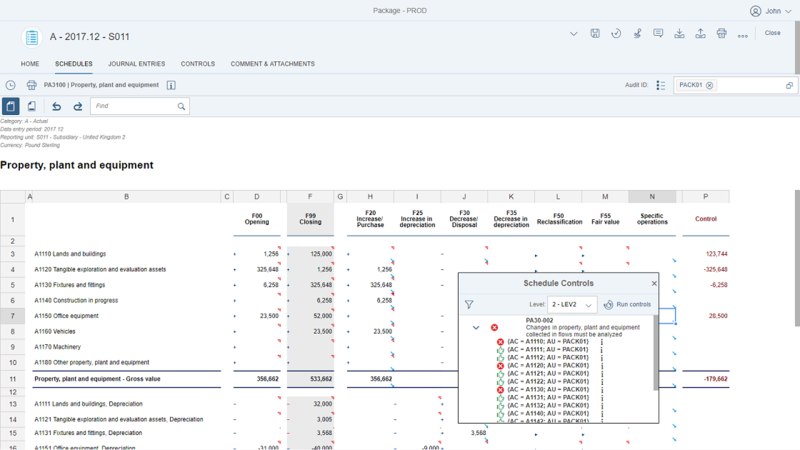 The SAP Fiori page header guides you through the actions you need to perform: for example, “controls to be run” when you update data in your package. 21. You can see if your package is in read-only mode and the reason why (such as ‘Currently opened by Mrs. Smith’ or ‘Protected’). 22. At any time, you can either expand or collapse the SAP Fiori page header; for example, if you need more space to see your package schedule. 23. Only relevant pop-up messages appear; such as confirmations before deleting an item. 24. A toast message now appears when an action has been completed; for example, when an import is finished. 25. Regardless of the list, and of the action you perform on multiple items (for example publishing multiple-packages) the number of processed or unprocessed items is systematically displayed. You can easily see why some actions failed. 26. Benefit from our form-based approach which minimizes the number of screens needed to define imports, run data link, consolidations or reconciliations. In the HTML5 web, all settings are in the same screen (while the legacy web and Windows clients are based on a wizard approach where multiple tabs and screens are required to define your settings). 27. When collapsing the sections of your setting screen, you can see all your choices at a glance. 28. Use lists just like dashboards to monitor your data collection, manual journal entries, or consolidation processes by searching (see 19), filtering and sorting (see 20) on a large selection of properties (including unique properties, see 22 and 23). 29. Streamline your daily tasks with our HTML5 web “Google-like” search feature available in all lists, such as: packages, manual journal entries, consolidations, reconciliations or reports. 30. Define your own persistent filters and sorting to focus on what is important. 32. When you select multiple items, for example to publish packages, post journal entries or lock consolidations, you can check the selection before launching your action. 33.See the status of your local manual journal entries in the package list. 34. You can display the scope, variant and currency restrictions for manual journal entries. 35. Access import features directly from the HTML5 web homepage, with a dedicated tile for the package import and another one for the manual journal entry import. 36. When you choose the option Delete amounts before importing, a confirmation message appears before you can proceed with the import. 37. After the import of multiple packages or journal entries, you can display the errors for each package or journal entry. 38. When you import, calculated data will appear as warnings, instead of errors. 39. Error management has been enhanced for journal entries. For example, you can more precisely see why an import failed (for example, you have insufficient data access rights or the ledger is protected). 42.You can search within the import error results. 43.You can filter the errors by type. For example, you can display only the members that do not exist. 44. You can download the import errors to Microsoft Excel. 45. In the import options for a journal entry, the UI terminology has been updated (for example, “Replace” has been changed to “Delete first”). 46. You can jump directly to the package list or to the central manual journal entry list from the Import page. 47. ♦Import from within a package – only the table or file rows that identify the current package are considered, the other are ignored and even don’t appear in the results. 49. In HTML5 web, you can choose what to print in one single screen, including the schedules/reports selection. 50. Selecting schedules and reports is easier and more intuitive. 51. In HTML5 web, you can be notified when a consolidation is complete. The notification area appears at the top of the screen so that you can see it regardless of where you are in the application. 52. In the notification area, you can see the last log message about your consolidation. This is particularly helpful if your consolidation failed. 53. You can specify in your user preferences whether you want to receive notifications. 54. A web assistant / in-app help is embedded in our HTML5 web packages. You can benefit from a context help that provides context specific information for UI elements directly within the application. Only help that is appropriate for the current screen is shown. Hot-spots emphasize the UI elements for which help is available for. A laser highlights the connection between the help content and the hot-spot. 55. ♦Customize the web assistant / in-app help to your companie’s needs. 56. In HTML5 web, defining and displaying your favorite reports has never been so intuitive. 57. Use “Google-like” search in the folders, books, schedules and reports. 58. You can define your user preferences to show or hide the “Multiply/Divide” feature in all package schedules. 59. Enter data in the package schedules or analyze data with reports using “Excel-like” grids. 60. Use the new “Find” feature to locate data or text within a report or schedule. 61. Undo or redo a data entry. 62. Resize rows and columns in the grid*. 63. When you run a schedule or a report you can select dimension values in one single form, instead of the five-step wizard previously used. 64. When you run a schedule or a report, the UI for defining hierarchies is much simpler. 65. ♦Choose your report preferences applied by default when running reports (formerly called “Viewpoints”). 66. ♦In the report list, you can see the reports you use the most, how many times they’ve been run as well as their last execution date. 70. In HTML5 web, you can work on multiple packages simultaneously with the use of tabs, and easily compare your packages side by side. 71. Package validity now has three possible values: Valid, Not valid (new icon), and To be validated (new value). 72. A simpler UI has been designed for publishing multiple packages. 73. Run controls on a package schedule or manual journal entry using the new HTML5 web Control widget feature. For packages, the control widget only displays the controls that are specific to the schedule you are working on. 74. When you import data from another package, the proposed package list is intelligently filtered with packages that have the same currency as yours. 75. For multi-period import, the mapping between periods is only displayed when relevant. 76. The post-import options, such as run package rules or run controls, are only proposed if they are relevant for your package. 78. Your Run Data Link settings are persistent, when you navigate in the application or log back, the settings of your last run are still there. 79. Upload your source file from your desktop, just like in the legacy web. 80. The Data Link logs are restricted to the user who has run the task, it’s safer. 95. You can jump directly to the package list from the Run Data Link page. 96. In the central manual journal entry page, the reporting ID lock appears directly in the reporting ID-ledger tree bar. 97. You can lock or unlock your ledgers much easily (directly from the ledger tree). 98. Use a simplified “Duplicate” feature: you can now directly paste journal entries without an intermediary screen. 99. Duplicate manual journal entries on different periods. 100. You can duplicate manual journal entries on multiple data entry periods in one go, instead of one by one. 101. The journal entry editor UI is tidier (less icons) and still provides all useful information. 102. Just like with the SAP Fiori page header (where you can see your overall status and properties), you can expand or collapse your journal entry header (where you define items such as the reporting unit and audit-ID). This comes in handy if you need more space to see the journal entry. 103. In HTML5 web, you can change the reporting unit in an existing central manual journal entry. 104. When saving the central journal entry, you are now warned when the description is missing. 105. The breakdown rows now appear just below the Account-Flow row they are associated with. 106. Entering a breakdown row is now a step-by-step guided process. For each step, the software only proposes authorized dimensions. 107. When working on a journal entry with a large number of rows, you can hide calculated rows. Your entry is much easier to read. 108. You can display or hide all breakdown rows in one click. You can see your entire journal entry at a glance, including all breakdown rows. 109. Expand your journal entry (see 58) and find data or text in your entire journal entry using your browser’s CRTL+F feature. 110. The Debit-Credit difference is now calculated and displayed for both the full journal entry and for each flow that has to be balanced. 111. The overall Debit-Credit difference is displayed in real time as you enter the journal entry*. 113. For the packages, a new global journal entry status for each package (combining all ledger statuses) appears in both the package list and in the SAP Fiori page header of your package editor. 114. You can close an unbalanced manual journal entry in a package, and a new “Not Balanced” status is available. Of course, you still cannot save your package if journal entries are not balanced. 115. In the HTML5 web consolidation list, you can see the progress bars for the consolidations currently running. 116. Lock the scope or the reporting ID directly in the consolidation list*. 117. When creating a consolidation, all settings (for example identifiers, properties or opening balance consolidation) are selected in a single screen, whereas in the legacy web and Windows clients you had to use multiple screens. 118. Choosing a scope is mandatory to avoid running a consolidation which would fail. 119. You can run a consolidation directly from the editor. 121. 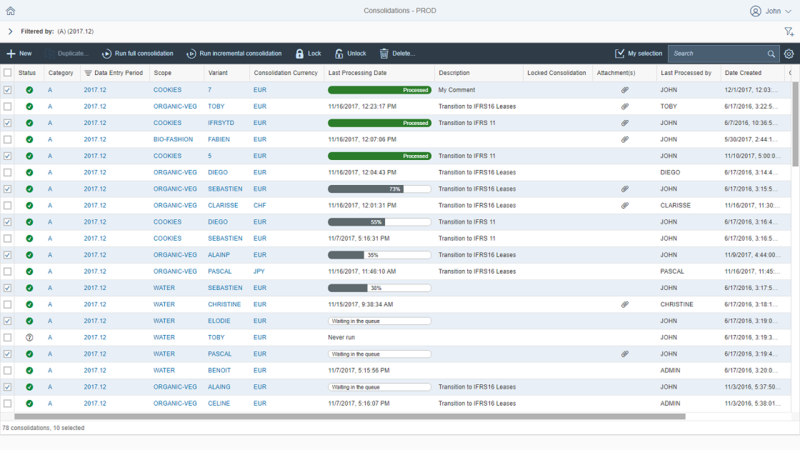 ♦The description of the consolidation / reconciliation is saved for all languages at the same time. 122. In the scope list, columns “reporting unit hierarchy” and “secondary reporting unit hierarchy” are now more explicit (they are named “Rollup” and “Rollup2” in the legacy web and Windows client). 124. You can benefit from more detail for the “reporting unit hierarchy” and “secondary reporting unit hierarchy” columns. In the legacy web and Windows clients, they were only identified with a flag whereas now 4 different statuses are available. 125.Scope settings are displayed in one single tab (vs. multiple screens in legacy web or Windows), in sections that you can collapse with a summary setting display. 126. When creating a scope, the reporting unit filter is automatically applied, and inserts the reporting units without having to click on “apply filter”. 127. The reporting unit properties such as ownership or financial interest are directly updated in the grid: what you see is what you update. 128. The reporting unit properties that can / cannot be updated are directly visible in the grid, so it’s more readable and easier to use. 129. Reporting unit properties that cannot be changed are in read-only, whereas in the legacy web and Windows clients the update was possible but then put back at the initial value with no indication to the user. 130. 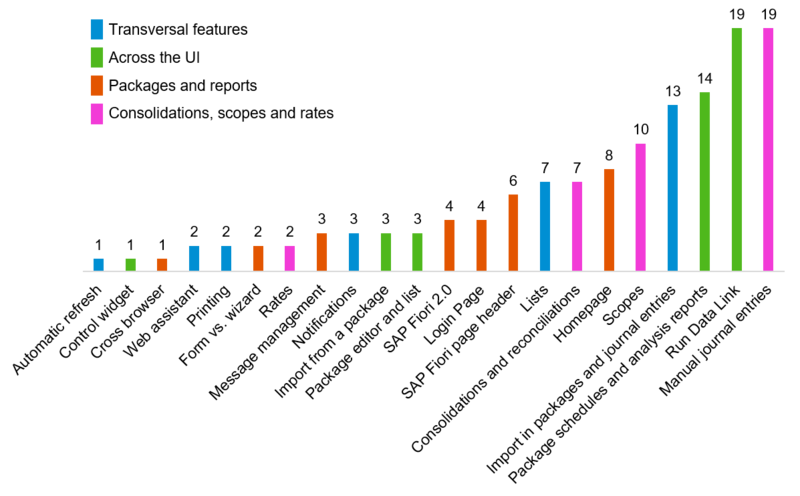 Column naming is more explicit and consistent (for example, all opening values start with “Op.”, closing with “Clos.”, rates with “%”). In brief, a concept is always named the same way. 131. Our new “Google-like” search feature is available for all the columns of the list. 132. Use the new HTML5 web “Find” feature to locate data or text within the Conversion Rate or Tax Rate report. 133. You can display an instruction guide for your rates. *Feature exists in both the HTML5 web and Windows clients (but not in the legacy web client). For a comprehensive feature description of the new HTML5 web client, you can refer to the complete Web HTML5 User Guide available on our SAP Help portal.